The upper echelon of Norodom Ranariddh’s own party is publicly urging the leader to step down so officials can revive a moribund merger with Funcinpec. The move, officials from both sides say, would free up the parties to negotiate without the clashes between Ranariddh and Funcinpec head Nhek Bun Chhay that have upended previous mergers. Sao Rany, an NRP lawmaker and secretary-general of the party, told the Post that the act was a negotiation strategy to build up power before next year’s national election. “I see that if we do not merge, we will die in 2013,” Rany said. In June’s commune elections, Funcinpec and NRP had an abysmal showing. Rany said he and six deputy secretary-generals wrote a letter to King Father Norodom Sihanouk on Monday asking him to persuade Ranariddh to “take a break from politics”, or in other words, to resign. Pheng Heng, a deputy secretary-general with NRP, declined to comment about the letter. He did, however, confirm that it was sent and that he signed it. In a prepared statement, Ranariddh, the former prime minister forced out of power during 1997 clashes with the forces of Prime Minister Hun Sen, said he wasn’t the obstacle. He placed all the blame on “Nhek Bun Chhay’s sabotage”. “At first, I would like to remind … that the initiative of the merger between Norodom Ranariddh Party and Funcinpec, it really appeared from my will,” the letter stated. He also said Rany can’t use his secretary-general position as a negotiating tactic. Without the party leader’s involvement, Ranariddh added, any agreements reached won’t be recognised. The argument is spot on, according to the Committee for Free and Fair Elections in Cambodia’s Koul Panha, who is generally perplexed with the attempt to pull the rug out from under Ranariddh. Funcinpec’s Bun Chhay is happy to attempt an explanation. He told reporters in a press conference at Phnom Penh airport yesterday before leaving for China that the majority of leaders from both sides are in support of a union. The only roadblock is Ranariddh. Bun Chhay claimed that his popularity “with the people” has been going down. “As I see, 80 per cent of all those leaders want to have merger. 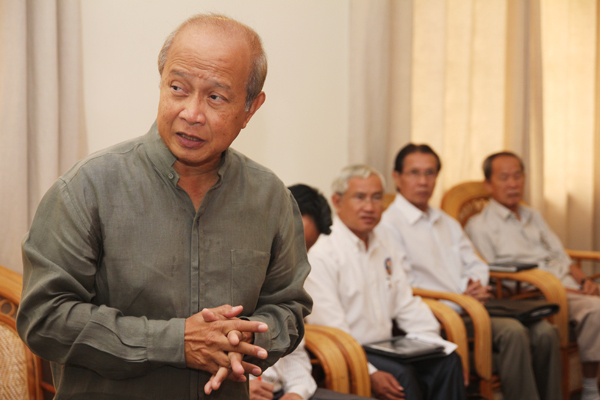 Therefore, I hope that the process of this merger can be possible,” Bun Chhay said. “I would like to say honestly that in the city, in public gatherings, with intellectuals, students, business persons, as I listened to them, most of them do not support him. He has supporters in isolated areas because they’ve heard that [Ranariddh] is the king’s son,” he added. The parties have tried and failed to join before. Prime Minister Hun Sen blessed the latest attempt on May 24, though it quickly sputtered. Leadership in both camps placed the blame on each other. Comfrel’s Panha said the constant bickering back and forth can lead to supporters losing faith in their respective parties. “They should get into discussions and dialogue. I think that’s important. Otherwise they’ll always flip, divide, and there’s no solution. The reason why the ground members, the supporters are frustrated, they are frustrated because they always see the conflict,” said Panha. The news comes only days after the Sam Rainsy Party and the Human Rights Party cemented their groups into one at a conference in Manila this week. The newly formed party will operate under the name the Cambodia Democratic Movement of National Rescue.